Today I woke to more news of horror. So close to home – just across the Pennines, a city where I’ve worked, where I have friends, a city whose history and culture I have studied for years now. And as I saw the first reports I wept, for the children who have been murdered and hurt and terrified, for the parents who are still desperately waiting to find out what has happened to their kids, or who are lost in unimaginable grief. My heart hurts. Manchester is resilient. It has had to be. We all have to be in this dangerous world, if we’re to hold on to what really matters, if we’re to love and hope and laugh, if we’re to bring children into this world and bring them up to love and hope and laugh. Whilst the usual suspects have been swift to inject their poison into social media, to encourage hate and violence in response to hate and violence, many more are trying to do the opposite. Always after attacks like these some rush to help and some rush to hate. The helpers try to contain the blast, the haters help to spread it. Our response will be to try to contain the blast, by showing that the overwhelming majority of people remain kind, decent, and big-hearted. This is not a platitude. It is a political response. But of course we feel anger. Of course we feel scared. Of course we feel loathing for the person who hated life so much that he could go into an arena full of happy, excited kids and commit mass murder. The point is, what do we do? If we let that anger be channeled into hostility to anyone other than the perpetrator and whichever group he claims to represent, they win. If we let fear prevent us from living our lives to the full, or push us to allow our freedoms and the freedoms of others to be curtailed, they win. Terrorists, of whatever political or religious persuasion, want to provoke fear and anger. As the UN defines terrorism, it is ‘intended to cause death or serious bodily harm to civilians or non-combatants with the purpose of intimidating a population or compelling a government or an international organization to do or abstain from doing any act’. In other words, whatever anger and fear we feel, however desperately sad we feel, we must not be compelled by their actions to do anything that is not in itself just, fair and right, nor to abstain from doing what is in itself just, fair and right. When we (those of us who argue in this way, as well as expressing our solidarity via social media with the victims) are berated for just waiting for the next atrocity, I wonder what it is that we (or our governments) should be doing instead. What form should our rage take, that could make us and our children safer? The voices of hate were quick to speak up, as always. They claim to be fuelled by righteous anger, but in their words there’s a hideous kind of glee. They call for action, but what they have in mind is closing the borders, or worse. The responses which would, of course, be exactly what the terrorists hope for, and would make us less rather than more safe. It is easy to dismiss the commonplaces, the impossibility in using words to deplore the lack of words. But the very fact of reaching for words – of trying to talk about it – is an appropriate response. And, at moments of crisis and trauma, the use of comprehensible and familiar phrasing is itself a sign of something important: it is a bid for connection. Cliché demonstrates community, our intention to understand one another. It does not matter that “standing in solidarity” has no practical import, or that prayers may be just so much shouting into a void. It does not matter that there is unresolved tragedy in a violent world that makes consolation a commonplace. So we should abandon any knee-jerk response … to hashtags and platitudes, to prayers and placards. There are always words, even over-familiar and trite ones. And they tell us something about our desire to connect and collect ourselves, to take the time to try at least to “think of the victims and the families”. That desire is a good thing. Clichés are good things when pressed into the service of communication in the aftermath of the incomprehensible and the traumatic. They often reveal the good intentions we share, and they are more valuable than ever. So I refuse to be embarrassed about the inadequacy of my own words. I believe that however feeble they are in the immediate aftermath of something which hurts my heart as much as this does, I can and must keep saying what I believe. Daesh divide the world into Crusaders (that this definition includes pre-teen girls at a pop concert tells you all you need to know) and the Caliphate. George Bush used similar rhetoric after 9/11, telling us that we were either with the US or with the terrorists. I’m not proposing any equivalence of those two approaches, other than that this polarisation, this reduction of the complexity and diversity of life into two opposing absolutes, has done and continues to do immeasurable harm. Specifically, the grey zone refers to the sphere of coexistence where Muslim and non-Muslim might live together. That’s anathema to the frightened young men of Isis, who yearn for a world divided on binary lines, with room for only two categories – them and the infidel. Such a world would be as clean and neat as computer code, with Isis the ones and the rest of us reduced to zeros. I made my own contribution on this blog. Looking back now, I am not certain that my interpretation of the grey zone was correct. It may be that it should properly be defined as the place inhabited by Muslims who have not signed up for the caliphate and for jihad. For Daesh it is a state of hypocrisy, and their hatred of it explains why the vast majority of their victims are Muslims – the wrong sort of Muslims. So whilst their murderous attacks in Kabul, Baghdad, Ankara and so many other locations are attacks on the grey zone, Paris and Manchester, Brussels and Nice, were attacks on the Crusaders. But we don’t have to accept any of their twisted, hateful definitions. The grey zone for me is where people of all faiths and none meet, talk, share music and food and laughter. It’s where in the wake of tragedy people of all faiths and none offer whatever they can – a free taxi ride, somewhere to stay, a blood donation. We must defend it. We have to refuse to be bystanders when anyone – on social media, on the street, in the workplace – demonises or harasses Muslims or those who look as if they might be Muslims. We have to have conversations across the various divides of age, ethnic background, religion, politics – find out what other people think, share what we think, find the common ground. We have to counter and debunk the lies that are routinely told about refugees, immigrants, Muslims, and the propaganda that xenophobic political movements such as the Front National, EDL/Britain First etc. and their equivalents across Europe will make of the Paris atrocities. None of this will stop Daesh. I’m not sure what will. How do you stop someone with an explosive belt and a Kalashnikov, who cares nothing for the lives of the people they will mow down, and nothing for their own life, indeed who is ‘seeking to be killed’ in order to gain martyrdom? Perhaps we cannot afford to be pacifists in any absolute sense. These are the moral quandaries that face us and perplex us, and we cannot take refuge in absolutes, because absolutes are a huge part of the problem. We’re all looking for a ‘magic bullet’ to use against this big bad. There may be political and/or military solutions (just as likely, I’m afraid, there will be political and/or military reactions that will hurt Daesh’s victims more than they hurt Daesh itself). For myself, what I want to do most of all is to fight – not with Kalashnikovs but with words and the way I live my life – for the grey zone. Because the last thing the grey zone is, is grey. It’s every colour under the sun. And it’s beautiful. And don’t let the murderers win. Since the announcement of Michel Butor’s death a few days ago, obituaries, hommages, appreciations and recollections have appeared in the quality press across Europe . But not here in the UK. Not a word. It wasn’t always thus. In 1956, Butor’s second novel, L’Emploi du temps, was published, with an English translation appearing in 1960 (Passing Time). The setting was immediately recognisable to British readers – a northern English city, rain drenched and fog bound, grimy and sooty, where you can’t get a drink until evening, and you can’t get a decent meal anywhere, at any time. This was Manchester, where Butor, fresh from teaching in Egypt and ‘inundated with sun’, came for a two-year stint as a lecteur at the University. Manchester, masquerading as Bleston, where Revel, a young Frenchman, came for a one year contract translating documents for a shipping company. It’s not the city’s landmarks that make it so recognisable. Butor keeps some features but plays fast and loose with their relative positions, adds a second Cathedral, and configures the railway stations in a kind of noose around the city centre. He transforms Belle Vue into Plaisance Gardens. His street names mingle the authentically Mancunian (Chorley) and the generic (New Bridge, Birch Street) with odd-sounding names such as Continents, Mountains or Geology. Anyone trying to use the frontispiece map as a guide to Manchester would very soon get as lost as Revel did – quite apart from the liberties Butor has taken with the real city, the map shows only those streets and landmarks which play a part in the narrative. Manchester’s Strangeways prison does, however, retain its distinctive shape and is a brooding presence at the heart of the novel. Manchester’s rain and fog, the smoke from its chimneys, the days without daylight, the sprawl of the city in which one could walk for hours and not reach the countryside, the black water of the canal – these are both the reality of 1950s Manchester and its myth. It’s reasonably clear at this stage that the narrator is writing in May about the events of the previous October. As the time scheme for the novel becomes more complex, the darker undertones become more prominent, and the reader will either be mesmerised, as caught up in the threads as the narrator himself, or merely mystified and frustrated. Philosopher Richard Wollheim’s 1969 novel A Family Romance uses a diary format to chronicle a man’s plans to poison his wife. The protagonist is reading L’Emploi du temps and ruminates on the notion of murder and argues – seemingly with Butor but more accurately with Revel – about the way in which the diary records events, looping backwards and looking ahead – but ultimately coming to a realisation that ‘a man might change his mind’. a “recombinant narrative” or generative cinema DVD video installation, using archive footage of Manchester of the 1950s, and a voiceover spoken by a computer programme, which uses the capacity of the DVD medium to present different scenes and spoken text so that the narrative never repeats itself. The experience is like the 1001 nights, in that the story has no beginning and no end, but rather an immersion in a narrative world where fact and fiction are blended. I have explored elsewhere the response of W G Sebald, who came to Manchester 15 years after Butor, to L’Emploi du temps. This is evidenced in his long poem, ‘Bleston: a Mancunian Cantical’, published in English translation in 2011. The darkness of Bleston fed into his state of melancholy, his alienation from his birthplace and his preoccupation with the landscape of trauma. So, different readers will find different ways of reading this complex novel. In doing so they echo Revel’s own efforts to make sense of what is happening to him, of what Bleston is doing to him, or what he can or can’t do to it. As he reads the detective novel Le Meurtre de Bleston he extrapolates from the hints and clues in the text and conversations with friends, coming to believe that the novel is a fictionalised exposé of a real murder and thus that his revelation of the pseudonymous author’s real identity threatens his safety, and ultimately that a road accident which befalls him is an attempted murder. He casts himself as the detective, just as he casts himself as Theseus once he discovers the series of tapestries telling that story. He casts the city as a sorcerer, as a Hydra, as the Minotaur within the labyrinth of its streets, and himself as embattled, attempting to resist its power. There are so many threads that one can follow through the labyrinth of the text. But given its capacity to draw in British readers in particular through the fascination of seeing ourselves through others’ eyes, and through the dry humour of the portrayal of a 1950s northern city, it is sad that Jean Stewart’s English translation is currently only available at prices that would deter all but the most dedicated readers. Perhaps, when the British press gets around to noticing Butor’s passing and commemorating it appropriately, some enterprising publisher will take a punt on reissuing it, and giving a new generation of readers the chance to explore those rainy streets and lose themselves in Bleston. What happened on that Leap Day we will never know. We have some details of some of the events and developments of that month – the diarist, Jacques Revel, dines with the Bailey family for the first time (whilst noting that he was spending less time with their elder daughter, Ann, as his affections begin to drift towards her sister Rose), and meets George Burton for the first time, not knowing at that stage that he is the author of the detective novel which plays an important role in events. He buys a second copy of The Bleston Murder, having lent the first to Ann. None of this suggests that February 29 would turn out to be an especially significant date. Of course, February 29 is always going to seem significant, by virtue of its rarity. It’s a day that only exists once every four years, and thus one that can be, in effect, hidden for three out of four years. Almost a ‘jour fantome’. Is it the centre of the labyrinth that is the narrative of Passing Time? Some have said so – describing the date as the ‘geometrical centre’ of Revel’s year in Bleston. If you do the sums, it’s one month short of the halfway point of Revel’s year in Bleston. However, his final month is a month of tying up loose ends and saying his ‘adieux’ – with the announcement of Ann’s engagement to his friend and colleague James (her sister Rose has already become engaged to his friend and compatriot Lucien) he is merely passing time in Bleston until the pre-ordained departure date. Indeed, he feels himself reduced to a ghost, a Sunday-afternoon ghost, revisiting the places he has known during his life in Bleston. Revel’s diary is an attempt to master the city which has bamboozled and disoriented him from the moment of his arrival, by creating with his own narrative the Ariadne’s thread to guide him through the labyrinth. In doing so, he creates his own labyrinth, as what is initially a straightforwardly linear account twists and turns, as he reflects on more immediate events, reminds himself as he records the events of one day of the later developments that they foreshadow, and so on. So his failure to record what happened on 29 February is, firstly, indicative of the failure of this enterprise. The time of writing and the time written about will never be reconciled and this gap is the evidence of that disjunction. It’s a blank space, an empty centre, an enigma. The final page is a record of other failures. He notes that he ‘had not even been able to visit the old church of St Jude’s on the other side of the Slee’, St Jude the patron saint of desperate cases and lost causes. St Jude’s is close to a small synagogue, which Revel has also failed to visit (having forgotten that he’d wanted to do so), and to the sinister prison, itself described as ‘a sort of hole’ within the tissue of the city. He describes ‘those sinister days in February’ when his longing to leave the city is at its most intense, but which he would prefer not to think about, ‘but which on the contrary I ought to be able to pick out from among the tangle of my winter memories with strong supple pincers of language, which I ought to keep firmly before my eyes’ (p. 286). So rather than being unable to recall what happened on 29 February, perhaps Revel chooses not to. It’s not just a generalised recognition that he ran out of time to fill in the gap, it’s a deliberate blank, which draws our attention to a significant absence. Like the blank space on the back of the detective novel, where the author’s photograph should sit, like the missing pieces in the sequence of stained glass windows, the blank spaces on the frontispiece map, the ‘terrain vague’ on the outskirts of the town, the incomplete New Cathedral building… ‘an incomplete alphabet of which I know one letter is missing, a keyboard of which I know one note is missing, a Tarot pack of which I know one card is missing’. That the missing day is the one that only occurs every four years (it occurred in 1952, the year in which Butor arrived in Manchester) obviously draws even more attention to it. 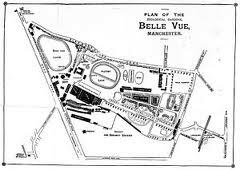 The long history of Belle Vue Gardens in Manchester is being celebrated this month, and it seems timely to note its appearance, under the name of Pleasance Gardens, in Michel Butor’s Manchester-inspired 1956 novel L’Emploi du temps (Passing Time). Butor’s view of Manchester (Bleston in the novel) was, it must be admitted, largely negative. He loathed the climate, and the food, and seems to have been deeply unhappy in the city, where he arrived to take up the post of lecteur in the French department at the University in 1952. He seems to have taken to Belle Vue, however. Pleasance Gardens, along with the various peripatetic fairs which rotated around the periphery of the city, on the areas of waste land, represent a mobile and open element in a closed, even carceral city, and a window on different kinds of community than those indigenous to Bleston. The narrator sees the friends he knows in a different light in these places, which may be in Bleston but are not fully part of it and don’t share its malaise. 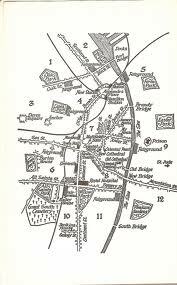 Pleasance Gardens appears on the frontispiece map, in the bottom left-hand corner, its shape not dissimilar to that of the real Belle Vue. Butor took from the real city of Manchester the geography and architecture that interested him and that fitted with his narrative preoccupations, and ignored or altered the rest. The descriptions include a great deal of precision and detail – however, the historians of Belle Vue will have to judge where the fictional version departs from its model. The monumental entrance-gates whose two square towers, adorned with grimy stucco, are crowned … with two enormous yellow half-moons fixed to lightning conductors, and are joined by two iron rods bearing an inscription in red-painted letters beaded with electric bulbs then gleaming softly pink: ‘Pleasance Gardens’. There was scarcely anybody in the big, cheap restaurants or in the billiard-rooms; avenues, all round, bore black and white arrows directing one to the bear-pit, the stadium, the switch-back, the aviaries, the exit and the monkey-house. We walked in silence past roundabouts with metal aeroplanes and wooden horses, … and past the station for the miniature railway where three children sat shivering in an open truck waiting to start; and past the lake, which was empty because its concrete bottom was being cleaned’. Posters everywhere echoed: ‘Come back for the New Year, come and see the fireworks’. A later visit, in summer, followed one of the fires that feature so frequently in the novel. Belle Vue was devastated by fire in 1958, and whether this account was inspired by a real event I do not know – it may well be that whilst Manchester was plagued by an unusually large number of arson attacks over the period that Butor was there, he extrapolated from that to a fire at Pleasance Gardens, purely for narrative purposes. If Butor generally warmed to the Gardens, his portrayal of the animals in the Zoo is less enthusiastic – he speaks of the cries of the animals and birds mingling with the noise of demolition, of melancholy zebras and wretched wild beasts, and of their howls during the firework display. Perhaps their imprisonment chimed uncomfortably with his own sense of being trapped in the city. I’ve written previously about the relationship between Bleston and Manchester, and about the links between Butor and Sebald, and I’ve just been exploring the fascinating collection of essays on Sebald in Melilah, the Manchester Journal of Jewish Studies, alerted by Helen Finch’s recent blog about Sebald’s Manchester. It’s good to see the link with Butor explored a bit more, but I would have to take issue in some respects with Janet Wolff’s article, ‘Max Ferber and the Persistence of Pre-Memory in Mancunian Exile’, which I think fails to fully identify the deeper connections between the two writers. I would agree that Passing Time is not about Manchester in a straightforward way but I think Wolff takes that too far when she says that ‘none of this is about an actual city’, and that Revel’s diatribes against Bleston are ‘the ravings of a neurasthenic, whose debilitated psychological state produces monsters in the environment’. (p. 52) This is not a new charge – reviewers have in the past diagnosed Revel with depression or schizophrenia. But I’d argue that rather than alerting us to an unreliable narrator, the mismatch reminds us that Bleston is not just Manchester, not just any particular city. It contains many cities, real and fantastical. But it is based more upon Manchester in its physical reality than on any other city, and contrary to Wolff’s statement that ‘there are no physical descriptions at all (quite unlike the Manchester of ‘Max Ferber’)’, there are many descriptions of Manchester landmarks, as J B Howitt has shown (in his article ‘Michel Butor and Manchester’, even though Butor takes and uses those features which are relevant to him, and changes or ignores those that are not. What interests me most, however, is Wolff’s argument that the Manchester of The Emigrants fades into insignificance in relation to ‘another geographical, phantasmic and persistent presence’. My studies of Butor are concerned precisely with identifying that presence in Passing Time. More anon.